Clearly there are issues on the offensive side, but to think it's all on Roushar shows limited vision. When the team has difficulty executing bread and butter plays leaving the team bad down and distance situations series after series, game after game - all season long, "creative playing calling" will not create sustained drives. When the whole thing is out of sync due to drops, misfires, a patch worked and ever changing O-line, bad routes, poor decisions, penalties, etc., play calling becomes a nightmare. Plays are supposed to build on each other, fulfilling a game plan over time. When it doesn't happen at all - for the reasons stated, it restricts options in the playbook because you are desperately trying to avoid ANOTHER bad down and distance situation. Rousher was just as much a victim of the offensive problems or probably more, than he was a cause. Why Does This Bowl Game Seem So Different? This BWW Bowl game is a weird one for me. I can't recall having less enthusiasm about a post season Spartans game. Is it because other fans are not lit up about it? Is it because the game this year were generally not fun due to an out of sync offense - even though they were close? Is it because of unmet raised expectations? Am I just too busy and it has nothing to do with the team or the 2012 season? What is it? "Even I could outrun Andrew Maxwell." Give-up the outdated offense. Man-up and run the spread. Yeah... like the best teams in college football... wait... ND, Bama, and Florida are teams that have been success based on defense and running the ball. Crazy. Bama and LSU last year had QB's throwing the ball 40+ times, right? And ND runs the ball out primarily of the spread, junior! How 'bout that Oregon team or the Texas A&M team that beat 'Bama? Gads you are f-ing stupid. The spread doesn't necessarily have to be - and usually is not - a pass first offense. ND runs a single back offense... not the spread. Oregon lost to Stanford... another non-spread team. And A&M lost to Florida and LSU... non-spread teams. And you proved the point... Look at how often A&M and Oregon line up with 4-5 WR packages? The closest thing to that, that ND does is have a 3 WR package, with Eifert (a TE) split out, and Riddick running a rout. Even on that note, if ND runs the spread, then so does MSU. How many times did MSU run 3 WR formations (even started games with 3 WR), Sims split out and Bell running a rout? I guess you have a different definition of what constitutes a spread offense. IMO the spread offense is a system that forces the defense to spread out and allows the offense to take advantage of the weaknesses in the defense. In other words, most defenses don't have 4 or 5 guys that cover that well and/or the ability to stop the pass and not get gouged in the running game. So how exactly are you a run heavy team, out of the spread unless you are running the spread option (like Oregon or RichRod)? Seems like you are taking 2 or 3 blockers out of the game and forcing your RB to beat the 7 guys that are normally in the box in most teams base defenses. I think I can run faster than Maxwell. How about we find the right quarterback who can run the offense? He isn't capable of moving this team in "real time". Should MSU win the bowl, then Maxwell joins a very small group of first year Spartan QB starters with a winning season. There have been only 3 in the past 40 years. Kirk Cousins, as an example, went 6-7 his first year and he had experienced receivers to throw to. He also had a place kicker (Swenson) who hit 20 of 23 FGs compared to Conroy and 22 of 31 FGs. Maxwell gets all the blame, when it was the team that was playing. Too simple-minded. Offensive line, receivers, missed opportunities on defense, special teams, 1-dimensional play calling (coaches), etc., etc. How about we have a balanced outlook on things, eh? Michigan State, historically, takes big steps backwards when a new QB starts. I don't think Conroy is to blame either, he was put in too many kicking situations and many very long. It was a perfect storm this year for this mess. I think injuries 1st, Maxwell 2nd and a pathetic offensive plan (Roushar & Coach D) 3rd. They seemed to march the field all year until the redzone and go 3 & out. In fact as I mentioned in another post they are dead last in the B1G for red zone td's. With that being said Maxwell isn't ALL to blame but he did not improve this year, he got worse (which scares me). I am not going to totally blame Conroy but the guy was a career 82% kicker coming into this year and he barely clears 70%. That means he should have made about 3 more of those misses named above. Does that equate to 1 more win? Maybe. I think while we would still be disappointed, we would look a lot different on this season at 7-5, especially if that one came at U of M. And as was stated, poor kicking was just part of the overall issues this team had. By the way, outside of the 48 yarder against OSU (which is well within Conroy's range), those other misses were all about 40 yards which for a guy that is perfect from 50+, are not long field goals. Even in the "off weeks" after a hugely disappointing Spartan football, M-Live Reader and avid reader-poster, "ATownAndDown" is still bringin' it - every day. Gimmicks, the last resort of a desperate man. Can no longer recruit good lineman so our QB needs to run for its life. Since when is a QB moving his feet a gimmick? The fact of the matter is that college football has gone through a transition recently. You are now seeing QB's coming out that are ready to play at the NFL level because they are no longer playing in college offenses but rather are being asked to play in NFL-type systems in college. Guess what most (not all) NFL QB's have to do? Move their feet (bootleg, buy time, or scamper for yards when the defense turns it back). Changing the MSU offense to reflect that more and work with the QB's to be more of that type of QB is far from a gimmick. The following post is a response I entered on M-Live to a reader debate on Andrew Maxwell. Some fans seem to think he has earned a spot on the bench. Some defend him. Some want Connor Cook. Some want Damion Terry who is breaking records in Pennsylvania HIGH SCHOOL football. Others want to can Dan Roushar, the offensive coordinator. There won't be much drama around any of this stuff in the "off season" - at least not by design. The offense is an eco-system. When one part goes bad, it contaminates the rest. The nightmare started with the receivers dropping passes and running bad routes which affected the flow for play calling (consistent negative down and distance situations and available options to deal with it - coaching did not adapt well). The drops and negative down distance and poor flow to play calling complicated Maxwell's development and reduced confidence. When he did make a bad throw or bone head mistake (some, that every QB makes), the stakes were higher - the receivers had already used up the margin for error, making each throw more and more critical (causing fans to further increase the pressure with each sailing pass) as the "3 and outs" kept rolling in. Then the injuries started coming in waves along with the pressure of mounting losses and the emotional drain of close, "woulda-shoulds-coulda" games. Mix it all in and I'm guessing that only a few very special QBs would have impressed in their first year starting - especially as compared to the expectations surrounding the program (and even some trash talking/tweeting from inside the program). Don't get me wrong - Maxwell still played poorly. The coaching had oversights and flat out misses. There is no avoiding those facts. I just think it snowballed on Maxwell as the "eco-system" (of which he was a part) deteriorated around him. How does MSU fair when rushing on 2nd down and 8 or longer? "...So if the plan is to get tricksy by hitting them with a 2nd and long run when they least expect it, with an 18 percent conversion rate, MSU isn’t putting Maxwell into manageable down and distance. If MSU converts the third down it’s usually in spite of their current down and distance on third down instead of because of it." ...Read the full post with stats chart here. The section on Max Bullough is pretty cool too. Post-game locker room celebration: The Spartans (and Dantonio) version of the famed Camp Randall Stadium "Jump-Around" in the locker room at the 20:12 mark. Michigan Football Coach Brady Hoke has finally come out of the closet and declared his undying love for Michigan State and all things green. Hoke said he decided to open his heart on the matter as MSU prepares to play Nebraska. The Cornhuskers are tied with UM for the division lead after beating them last weekend on the strength of a festive second half in Lincoln. This leaves Hoke and his chUMps looking for help from somebody else to beat Nebraska. When asked about the situation, Hoke spoke like a man on a mission. "Here at Michigan, we do things the Michigan way. We expect Michigan Men to act like Michigan Men because we're at Michigan. This is Michigan, so we play like Michigan Men and we root for Michigan. And this week, that means rooting for Michigan State." Hoke was asked about his own pedigree as a self-proclaimed "Michigan Man". "Well I've always been a Michigan Man, ever since I was born in Ohio. My Michigan roots go back to my college football days, when I played for Ball State University in Muncie, Indiana. And I continued my deep involvement with Michigan as a young coach, when I held jobs in Ohio, Indiana, and Oregon. Heck, I even coached at Grand Valley and Western Michigan, both of which are schools in Michigan. "Let's put it this way. I coached at the University of Michigan for seven years and then left for the job at Ball State, my beloved alma mater. How much more of a Michigan Man could there be then me?" When asked about the possibility that perhaps Glenn Shembechler may have been more of a "Michigan Man" than himself, Hoke quickly accepted the suggestion. "Oh, of course Bo was the ultimate Michigan Man, having graduated from Miami University. Plus, Bo coached at Ohio State, not once but twice, and that's pretty much the pinnacle in the career of any Michigan Man." Hoke added that he has always felt a strong emotional connection to Sparty. "Personally, I love the big fella'. He always seems to look the same, no matter what else is happening around him. Plus, I love his wardrobe. We don't have anything like Sparty down here." Hoke said if he could speak directly to Sparty, he would urge him on to victory. "That's right, I might as well be Biggie frickin' Munn this week, rooting for MSU as if my life depended on it. Or at least my season. Which it does. "I plan to leave our game early in the second half so I can get a good place to watch the Spartan game with a big tub of popcorn. And some double-cheese meat-lovers pizza, with maybe a dozen Krispy Kremes. There's no need for me to be on the field in the second half, since I don't do anything besides strut around without headphones. Besides, if Denard doesn't play, we're toast. "Heck, I might just skip that stupid road trip to Minnesota so I can party with Sparty. What the heck is there to do in Minneapolis, anyway? Ask Sparty if he can get me some tickets to the big game, okay?" At this point last season the media hounded Mark Dantonio, MSU Players and Spartan Fans with direct questions related to another specific game not involving their own team. Some made out-right recommendations that Dantonio and the MSU family should root for the chUMps in their game against Nebraska because it might help the Spartans down the road IF THE SPARTANS LOST THEIR GAME. They suggested that to not do so shows Spartan insecurity and inferiority. They did the same in 2010 and 2008. As SpartanMan82 pointed out, the WHOLE concept and questions at that time, for that game were stupid. For that chUMps win to have any impact on MSU's chances to win the division, MSU had to lose a game - or two. They never did lose again for the rest of the season. For those Spartan fans who fell into that poorly disguised trap, what did that chUMps win get the Spartans? Nothing good. It sent MSU to a non-BCS bowl after playing the best team the conference twice, including a razor thin loss in the conference CHAMPIONSHIP game while the chUMps went to the Sugar Bowl against a sub-par opponent after avoiding playing Wisconsin at all. They never stopped bragging about the accomplishment and never stopped belittling MSU's successful season - to this day. You NEVER root for chUMps. WILL chUMps ROOT FOR NEBRASKA IN MSU'S GAME THIS SATURDAY? Here we are a year later. The Spartans play Nebraska the week after the chUMps lost to the Huskers. The chUMps are now tied with Nebraska for the division lead, but Nebraska holds the edge in the tie breaker by virtue of pounding the chUMps on Saturday. They need help from the Spartans. Will beat-writers ask Brady Hoke if he will be rooting for the Spartans this weekend? Will reporters ask UM players if they will be rooting for MSU to beat Nebraska so they can go to Indianapolis? Will radio talk show hosts challenge chUMp fans to let go of their hate for the team they claim is not a rival and root for the Spartans to show Nebraska who is boss? I predict that more than one of them, instead will actually suggest that some Spartan fans will root for Nebraska this Saturday in hopes of preventing chUMps from getting to the championship game that MSU earned their way to last year - with no help from the chUMps down the street. Stupid, but true. It will be presented as a real live topic. I know these guys. I live behind enemy lines. It will happen. Let me know if you hear it or read it. All together now... "This is why we call them ch... "
First, know that how you root does not effect the result of a game. Second, go rake the leaves. Do not watch the game. This way you are not rooting for the chUMps on a play-by-play basis. That is just sick. Finally, check the outcome of the game after it is over and celebrate the championship if the Spartans won it and curse the chUMps if they didn't. 1. Always root for the Spartans (to win a championship or anything else). 2. Never root for the chUMps to win anything. I DO NOT WANT chUMps ROOTING FOR US IN THIS OR ANY OTHER GAME! Click below for more media and blog post links following Wisconsin overtime win. 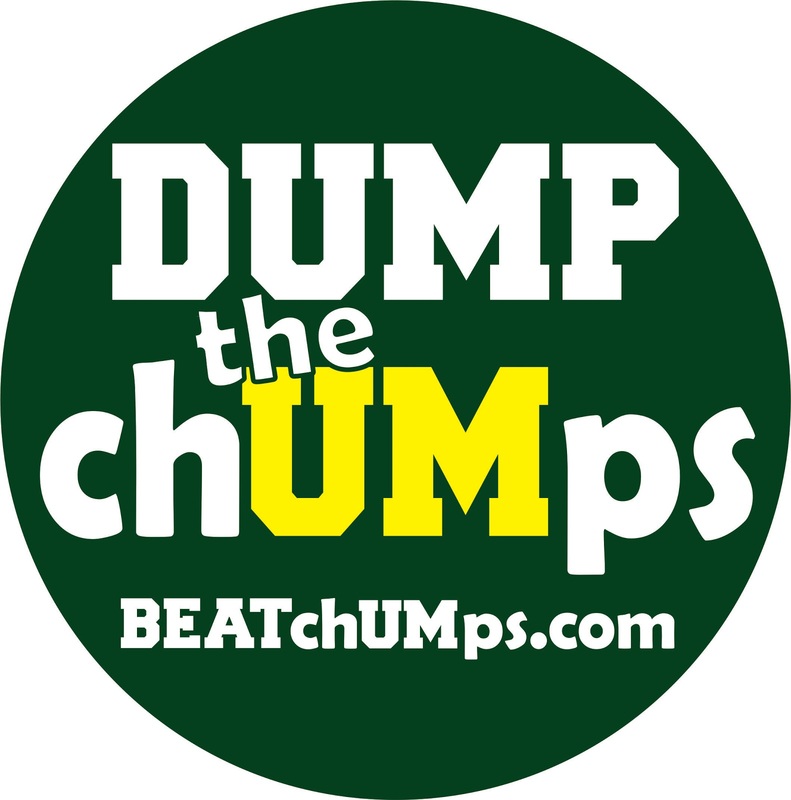 Click below to jump to links to media and blog posts following the Spartans final seconds loss to chUMps. Return2Glory got the positive juices flowing by watching 1999 MSU dominating perfomance over chUMps featuring an amazing day by Plaxico Burress. The game included a beautiful flea-flicker which ties in well will my interviews with SpartanMan82 and C-Mann79. C-Mann79 kept it pretty simple while SM82 wants to see something new. Believes it boils down to execution. If the Spartans show improvement they may not even need turnovers to win. Thinks the first series of the game for the offense and defense is crucial. MSU seems to fall behind early and he says that just can't happen today. Says if the Spartan's mindset is right, MSU wins. Believes that if MSU simply does what is on the game tapes they gave the chUMps, they will lose. The Spartans must show new formations to the chUMps defense. Dantonio must unveil some plays the chUMps have not prepared for, then, like CM79 said, they need to execute those plays. They need to have more than more Bell accumulate rushing yards and avoid overusing Bell in the first half. MSU cannot run between the tackles from the single back formation - they must run outside and have various plays and personnel from that formation. MSU should show something completely different in the second half that chUMps do not have time to adjust to. BIG TEN LEADERS, Passing Yards / Rushing Yards: Maxwell / Bell - Really? "In a season of maddening statistics here might be the most maddening one of all. MSU has the passer with the most yards (Maxwell) and the rusher with the most yards (Bell) in the Big Ten. You say MSU isn’t moving the ball? Apparently they are. Even more strangely, MSU and UM have the exact same redzone percentage at 87.5 on the same number of attempts (24). MSU has even kicked fourteen field goals, seven more than UM. So how does UM average 12.7 more points per game? Simple, MSU has scored 2 TD’s on offense from outside the redzone where Michigan has scored twelve." Could it be that the scoreboard has been simmering just below boiling? A missed block or wrong cut away from breaking the long run? A dropped passed away from keeping a scoring drive alive? A missed interception away from turning the tide? The big special teams play that appears a step away? Could it all happen in the same game? The right game? Will the Spartans sleepwalk again? Is there something "wrong" with this team from a mental or chemistry standpoint or is the pressure building for a breakout day? Could we see that incredible D make Denard look ordinary or worse? Could we see that shell shocked look on those fans packed in that hole like a can of sardines? Or, will it be the Spartans that lay the stink bomb? I think the outcome will be categorized as a surprise - no matter what happens! Check out last year's classic day-by day posts leading up to the game. I could hardly wait each day to read what SpartanMan82 was going to post next. Hilarious. There is Hope for Spartans. Really... Read This Post. I decided to dedicate this post to help talk "Anonymous" (see comments on previous post) and other Spartan fans off the ledge. There is hope my friends. Yes, the Spartans could win next week, but they could also get blown out. Yes, they could still win four more games, but might only win one. I am far more confident about 2013 than I am with anything to do with 2012. The "program" is not dying. It is not the end of "the good times". The foundation Dantonio constructed is stronger than a bad season. 2012 is a reality check. For Spartan fans who thought that MSU was going to become an Oklahoma, Ohio State or even a Georgia or the football version of Izzo's basketball program - it ain't gonna happen. It never was going to happen. East Lansing will never draw that many high caliber players - ever, no matter who is coaching here. MSU can, however, be highly competitive and have occasional shots a national prominence. Believe it or not - 2013 is a high likelihood year to make a big splash. Prior to the two magical seasons of 2010 and 2011 was a disappointing 2009 season (6-7 record). The difference with 2013? It will be MSU's best shot at a Rose Bowl since the Spartans actually went to the Rose Bowl. The Spartans list Seniors Caper and Conroy on the depth chart. Consider a 5th year senior QB with every receiver back (opposite of this year), tons of senior leadership with a bad taste from 2012 and the memory and experience of 2011. What are your thoughts? Click on the comments link below. Mickey Mouse & Michigan State football? This is a short blog post today because I want to solicit some good dicussion. After week two and MSU hung 41 points on a well-dressed CMU team, I was laughed out of many conversations when I bold stated “Michigan State is not a Top Ten team.” I felt that certain squads (namely defense) on our team could statistically be considered top ten worthy, but not the team. Fast forward five weeks as Michigan State (4-2 1-1) is plays Iowa, typically a winnable game, but this has not been a typical season. We’ve seen some dominating offensive performances. Le’Veon Bell has proven his workhorse capability to “carry” this team (ok bad pun). Receivers are starting to really come into their own, better routes, catching the football and excellent YAC (Yards-After-Catch). We’ve also seen some tenacious defensive showcases. This defense has the skill-level and the ability shut down even the most explosive of offenses. We’ve even seen Dan Conroy hit six FGs 44 yards or longer, three of those coming 50+ yards. But if you’ve seen any significant amount of MSU football, you know that each one of these squads has been exposed at least once or twice. MSU receivers… well, I think you know the story their so I won’t rehash their three-game stretch of 18 dropped passes. Dan Conroy, despite the long FGs is just 6 of 11 in kicks between 30-49 yards. So where does Mickey Mouse come in? Remember Saturday mornings watching cartoons- before College Gameday? Recall the Mickey Mouse cartoons where Mickey goes fishing. Invariably, Mickey runs into trouble when the fish puts a hole in the boat, which Mickey fixes with a piece of gum. Then, there is leak which Mickey plugs with his finger, followed by another one, plugged by Mickey’s toe, followed by two more leaks in the boat plugged Mickey’s other remaining toe and finger. You know how the rest of the story goes, that by the time the fifth hole is plugged, Mickey notices the piece of gum has been expanding the entire time, filling with water. It pops and the boat is filled with water and sinks. Don’t worry there’s an MSU connection. Each of the Mickey’s (I mean MSU’s) holes in the boat have come during different games. For example, last week we plugged one hole, with a solid passing (and especially receiving) game, and yet our defense gives up nearly 300 passing yards and 27 first half points to Indiana. Despite Michigan State plugging a boat hole in one of its squads, only to find a hole another place, what is going to take for MSU put together a complete (leak-free) game without any holes in the boat? Andrew Maxwell? Or Andrew Max-Really-Well? Replacing a starting quarterback is difficult in college football. Cadence calls, audibles, route-timing, hand-offs, and on-field leadership. Replacing a three-year starter, team captain and the winningist quarterback in Spartan history is almost insurmountable. Insert a patiently waiting-in-wings Andrew Maxwell, who had 52 career passing attempts prior to getting the starting nod as MSU’s 2012 signal caller. I’ve said from day one that it was up to Maxwell to control games but not take them over. Maxwell is a pocket passer in a Pro-Style Spartan offense. He’s not going to single handedly take games over, but simply needs to manage the offense. Four-games later the Spartans (3-2) have begun to wonder why they’re not winning. Any time a team loses, some of that falls on a quarterback’s inability to score more points than their opponents. I say that with the not-so-subtle caveat of last week’s West Virginia/Baylor shootout (final score: 70-63). But back to the Spartans. If I were to rank the top reasons why the offense is NOT scoring points, Andrew Maxwell would probably rank fourth. Did I hear someone say, “Prove it, chicken!” OK Biff Tannon it’s on.